One of the more popular events every April at Firebird is the Spring Warm Up & Swap Meet. 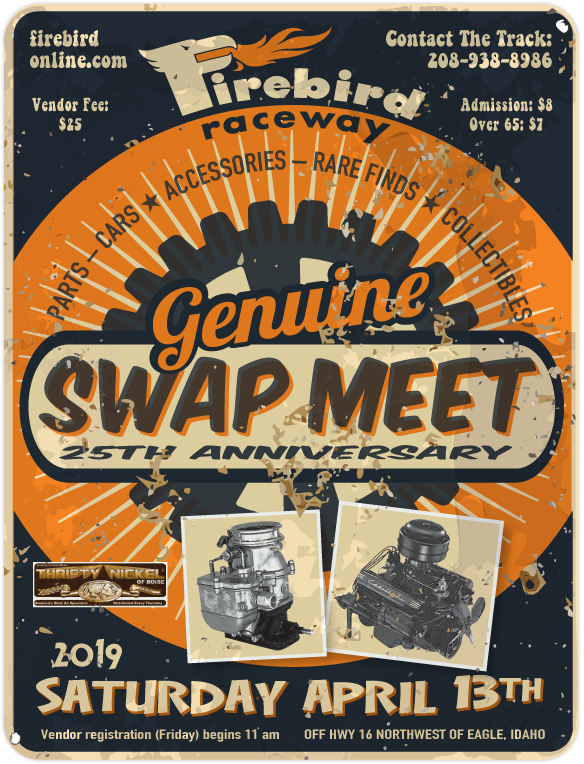 The 25th Annual swap “til ya’ drop” meet is Saturday, April 13. Vendor space assignments are conducted at the raceway when you arrive (no advance registration). Friday, April 12, will open no later than 11 pm (or when the vendor line-up reaches the highway). Then Saturday, gates will open to vendors at 7:30 am, followed by gates opening at 9 am for all buyers. The swap and test day continues until 4:30 pm in the afternoon on Saturday. The event not only features the largest automotive swap meet in the intermountain region, but also a full day of testing and grudge racing. Vendor space (10′ x 20′) runs $25. A test card is $35 (plus $7 for your annual number). If you’re just planning to buy, watch or attend the one-day event, adults are $8, 65 & older $7, 6-12 $3 and 5 & under free. Additionally, we offer pit parking for any “not for sale” rods, customs, street machines, restored’s and the like. Drive your rig out to the raceway and we’ll find you a place to park in the Firebird pit area. This gives you even a better reason to tool out to the raceway in your favorite ride.